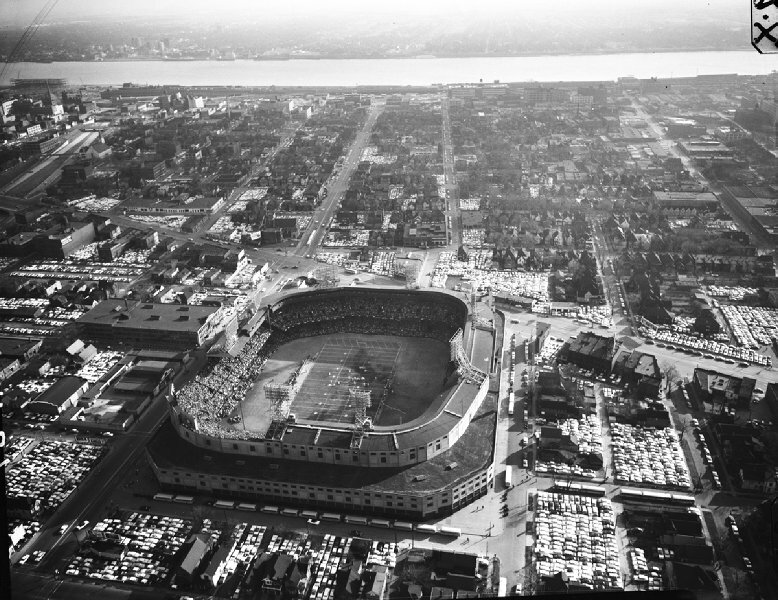 Perhaps one of the most popular stadiums in baseball, Tiger Stadium was the home of the Detroit Tigers for nearly a century. However, many people may not know that this historic baseball stadium was the home of the Detroit Lions for 35 years. The history of professional baseball in Detroit dates back to 1881 when the Detroit Wolverines played at Recreation Park and were part of the National League until 1888. The team joined the International League then the Western League and became known as the Detroit Tigers in 1895. Owner Arthur Van Der Beck bought the club and built a ballpark for the team at Michigan and Trumbull in 1896. Named after Tigers catcher Charlie Bennett, the Tigers first game at Bennett Park was on April 28, 1896. In 1901, the Tigers became a charter member of the American League and the ballpark’s capacity was increased to 8,500 from 6,000. The grandstand was in the shape of a L. A covered grandstand extended from behind third base to home and attached to a bleacher section along the first base side. Located in the outfield were trees, the Tigers clubhouse and the groundskeepers shed. By the 1908 season, the playing field was reduced as the main grandstand was extended into the field by 40 feet. A new bleacher section along the third base side was added increasing the capacity to 10,000. Bennett Park’s capacity again increased in 1911 to 18,000 when bleachers were added in right and left field. Because the stadium was built of wood, the threat of fire was great. This led to the entire ballpark being demolished after the 1911 season. A new ballpark of steel and concrete was constructed on the same site. Homeplate was moved from right field to where it was until Tiger Stadium closed. The new ballpark was named Navin Field and the Tigers played their first game at the ballpark on April 20, 1912. It could seat 23,000 spectators as a covered grandstand extended down the first and third base lines with bleachers in right field. In centerfield was the first baseball hitters backdrop in baseball. The first major addition to Navin Field occurred before the 1923 season when a second deck was added between the first and third base and a press box was added on top of the roof. This addition increased the capacity at Navin Field rose to 30,000. The 1930s gave Tiger Stadium its look that it retained for 70 years. In 1935, Navin Field was renamed Briggs Stadium after owner Walter O. Briggs. A series of expansions began prior to the 1936 season. The single deck pavilion that extended down the first base line and around into right field was double decked. Before the addition could be built in right field, a problem had to be solved. Trumbull Avenue was located behind the right field fence therefore the grandstands could not be expanded out. To solve the problem, the right field line was shortened to 325 feet and the upper deck extended over the lower deck and over the playing field 10 feet. Construction was completed by April 1937 and Briggs Stadium could seat 36,000 fans. After the 1937 season an additional expansion was completed at Briggs Stadium. The single deck pavilion that extended down the third base line and around into left field was double decked. A gap between the double decks in right and left field was filled with two decks of bleachers with the scoreboard placed on top. With this expansion, Briggs Stadium was now enclosed and had a capacity of 54,500, making it one of baseballs largest stadiums. Dimensions were 340 ft. (left), 440 ft. (center), and 325 ft. (right). Professional football made its debut at Tiger Stadium in 1938. 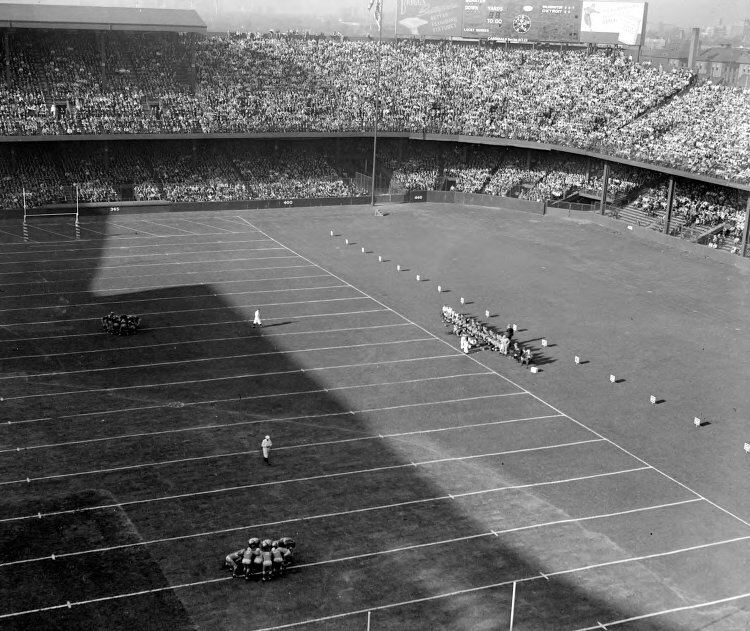 Between 1934 and 1937 the Detroit Lions played at the University of Detroit Stadium, a 25,000 seat facility. After the 1937 season the Lions decided to move to Tiger Stadium. The team played their first game here on September 9, 1938 when they beat Pittsburgh. Other than laying out the gridiron on the field, little had to be done for football to be played at Tiger Stadium. The football gridiron ran parallel to the third base line for baseball. Both teams shared the same sideline that was in the outfield. The Lions played at Tiger Stadium between 1938 until 1939 and 1941 until 1974. By the 1970s the Lions wanted their own stadium. A new dome stadium was built in Pontiac, the Silverdome, where the Lions moved to in 1975. On November 28, 1974 the Lions played their last game ever outside in Detroit losing to Denver at Tiger Stadium. Tiger Stadium was the home to many other events other than the Lions and Tigers including boxing matches and concerts. Fire broke out at Tiger Stadium in 1977 and destroyed the press box. The city of Detroit bought the stadium from the Tigers for $1 and decided to renovate Tiger Stadium. All of the original green wooden seats were replaced by new orange and blue plastic seats, a new video scoreboard replaced the old hand operated one in centerfield, and a new press box with two luxury suites were hung from the second deck. In 1993, $8 million in expansions were completed at Tiger Stadium, including building a food court called the Tiger Plaza, where the players once parked. By the early 1990s the owner of the Tigers wanted a new luxurious ballpark for team. A new ballpark for the Tigers was built in downtown Detroit, and the club moved to Comerica Park after the 1999 season. The last game at Tiger Stadium was on September 27, 1999. Many fans were saddened when the last game was played at “The Corner”. For nearly a decade Tiger Stadium sat abandoned as several attempts were made by preservation groups to save and renovate a portion of the facility for a variety of uses. The City of Detroit was uninterested in saving any part of the stadium and in July 2007 announced plans to demolish Tiger Stadium. Seats and other items were removed from the stadium in October 2007. Partial demolition of the stadium was completed by September 2008. Another attempt to save the remainder of Tiger Stadium was unsuccessful and the final sections of the stadium were demolished in September 2009.